← The Quirk and the Review – New Kid on the Block! I’m revisiting a post I wrote a while back when I was first getting into bread. Bread is my favourite thing to bake and I’m fascinated by the whole idea of yeast and its amazing ability to make humble dough turn into a beautifully risen loaf. This post details my first experiments with sourdough. I’ve updated the text and the photos of the bread are new too. My guide on the sourdough journey – and there’s more to come on this front – is James Morton, the Baker/Doctor who came to prominence in the 2012 series of The Great British Bakeoff. He has a pretty common sense approach to bread making and following his recipes has worked well for me. This recipe for sourdough bread and sourdough starter comes from James’ first book Brilliant Bread. Everything you wanted to know about bread making, and more! Lots of sound recipes and helpful advice too. Getting a sourdough starter going. This is a real labour of love. You have to be dedicated, patient, observant and accurate. A starter needs constant care and vigilance. It needs to be fed regularly, and, unless you hibernate your starter in the fridge, you have to look after it for ever!!! Or be prepared for the news of its demise. 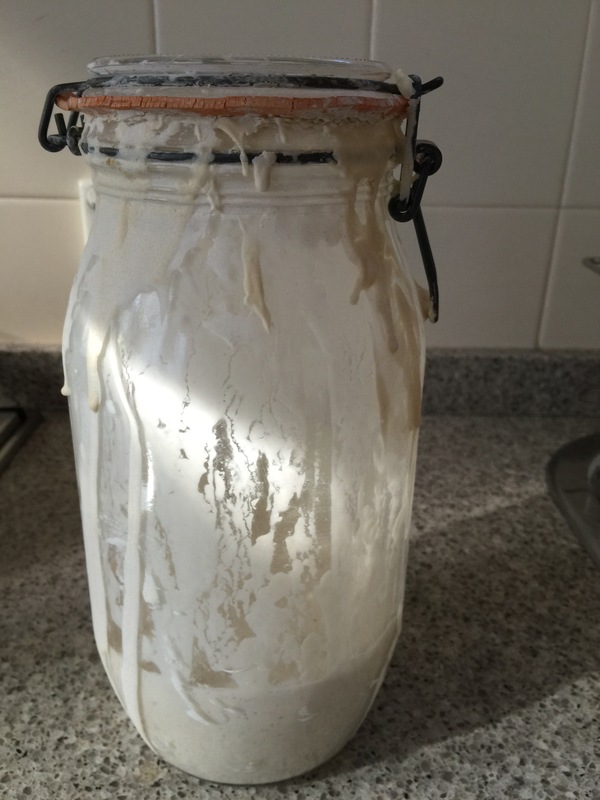 Your sourdough starter needs more care than a pet…. Here is an abbreviated recipe from James’ book. Buy the book to get the full, incredibly helpful story. 1. Take 100g strong flour and 100g tepid water and measure into a glass jar (see through is best so you can see what’s going on). 2. Add your starter aid to kick start the the starter. James recommends raisins – that’s what I used. 3. Cover your jar and leave for 24 hours at room temperature. 4. Whether the starter is bubbling or not, add another 100g flour and 100g water and stir vigorously to combine. 5. Leave for 24-72 hours, or until you notice plenty of bubbles forming through the mixture and that it has definitely increased in volume. Then pour away at least 3/4 of your starter. 6. Give what’s left a good feed of flour and water – make it up to at least the size it was before you poured it away. James recommends not bothering with weighing feeds from now on – always feed your starter using more flour than you think is already in the jar. James doesn’t mention how much water to add – having added the flour, I carefully add enough water so that the mixture looks roughly the same as it was before you threw stuff away. 7. Feed your starter every day and keep it at room temperature. You can put your starter in the fridge to hibernate if you’re going away or if you’re not baking. You will still need to feed it every week or so. If you want to use it, take it out of the fridge, let it warm up and give it a big feed. Once you are onto the feeding stage, use cheap white flour, as you will be using a lot of it. Remember, you need to discard at least 3/4 of your starter before you feed it. Of course, if you are using your starter for making bread, you have already taken away some starter so you can feed it at that point. Your can use your starter when it is full of bubbles and has grown in size in the jar. (It does get noticeably bigger, but I don’t think there is a level of “bigness” that is required). 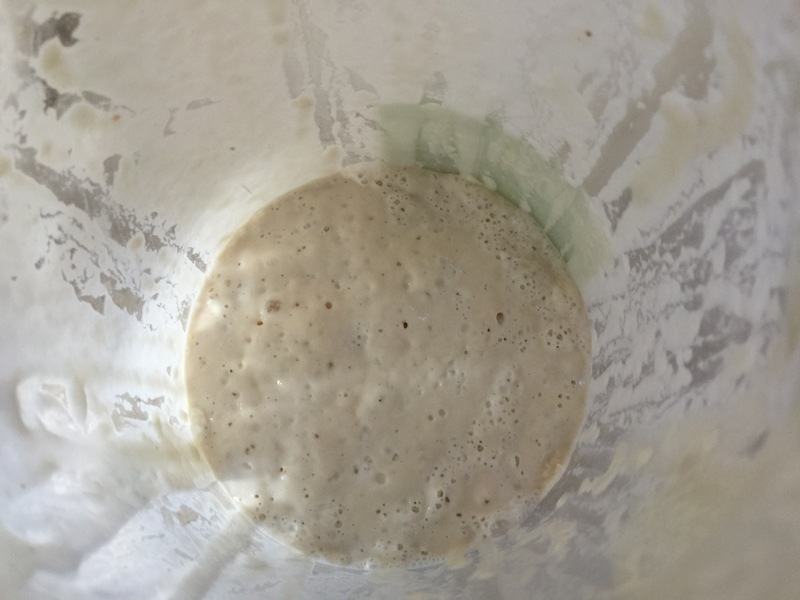 At this stage the yeasts in your starter are used to being fed – they are said to be in a “fed state”. This normally 12- 24 hours after a feed and if the starter is fed regularly. This is basically James’ recipe. But as with the starter, the book is really helpful for more details. In a large bowl, weigh the flour and then rub in the salt until combined. Add the starter and water and mix until it has come together into a very wet dough. Cover and autolyse for 30 minutes. (This is resting of the dough, letting the yeast get a lot of the work done for you, so that when you knead, your dough will come together more easily). Knead the dough for 10 minutes. Cover and rest the dough for approximately 4-6 hours at room temperature, or, alternatively, after a couple of hours, put it in the fridge overnight or during the day. This is an important stage, so the dough should be noticeably risen, if not quite doubled in size. Turn the dough out onto a well floured surface and then shape your loaf. I used the method of rolling up your dough like a Swiss roll really tightly. Then turning the rolled dough 90 degrees and rolling it up again. The dough will have a seam on the top. Carefully transfer the dough to a proving basket or a floured tea towel inside a bowl, with the seam side on top. I have used both on different occasions, here I used the proving basket. Leave to prove for 3-4 hours at room temperature until noticeably larger again. Or you can put your dough in the fridge to prove after an hour or two overnight or during the day. I left my dough to prove overnight. Preheat the oven to 240 degrees C at least 30 minutes before you intend to bake, and heat a cast iron casserole pot with the lid on. When the 30 minutes is up, it’s time to turn out the proved dough into the pot. Turn down the oven to 210 degrees C. Take the lid off the pot and carefully turn out the dough into the pot. The smooth side will be on top. Score a cross on your loaf with a sharp serrated knife. Bake for 40 minutes, then remove the lid and bake for a further 10 – 15 minutes until the top and sides are really brown. Remove from the oven, and let rest for 30 – 60 minutes. Serve with lashings of butter and your favourite jam. This time mine was apricot conserve from last summer’s bounty. Posted in Bread, Breakfast, Vegetarian and tagged bread, Brilliant Bread, James Morton, pot bread, sourdough, sourdough starter. Bookmark the permalink. Hot cross buns #easterishere #goodfriday #butter #spice #fruit #gbborecipe Recipe on the blog.